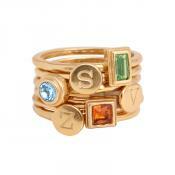 Use your imagination and creative skills to design your own personalized stacking ring. Pair an initial band with a birthstone band to represent each member of your family! 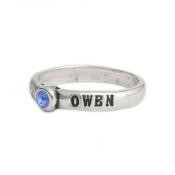 Or create a couple's ring with your initials and birthstones! 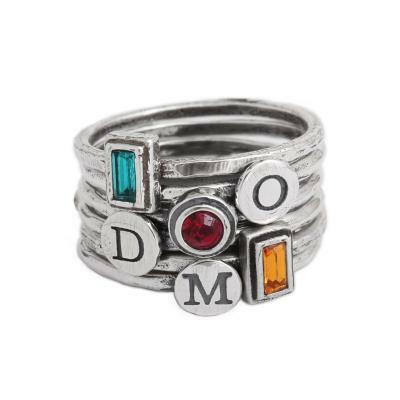 Mix and match with however many stacking initial and stack birthstone rings you want! Available in whole sizes 5, 6, 7 and 8. Create the perfect family ring! If you like to create your own style, this is the perfect ring for you...because you design your own ring! Using any combination of initial stack rings and birthstone stack rings, you can design a meaningful and beautiful ring that represents those you love, and that you will cherish forever...so start designing! Grandmother's Ring - the same as above but for all the grandkids! a heart, a last name initial a birthstone for the month you were married. 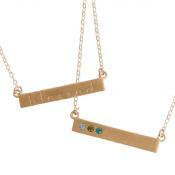 Please be sure to let us know which style of birthstone you want - rectangle, square or round! The price listed is for one initial ring and one birthstone ring, as you make your selection the price will change based on the number and type of rings you select. Click on the following links if you would like to order only initial rings or only birthstone rings. Dimensions: Hammered band is 1/16" thick. Initial plates are approx 1/4" round. Please understand that the bands are separate and stack on top of each other. All rings are sterling silver. Rings available in all letters and the "&", heart, cross symbols. Birthstones are Swarovski crystals and available in 3mm round, 3mm square and 2mm x 4mm rectangle settings in all birthstone colors (exception: October rectangle not available.) Stones vary in color by shape so please see the color chart for the color of each shape. Sizing: When determining your size, we ask that you give us a size that fits comfortably. The rings are available in whole sizes 5, 6, 7, and 8. If you are unsure of your size, you can purchase a ring and select ring sizer from the dropdown menu. We will send you a ring sizer and instructions on how to email us your size. If you are between sizes you need to decide if you want the ring(s) to fit a little snug or loose. I couldn't have been happier with my purchase, from start to finish. I chose this ring as a very special symbol of my relationship with my baby daughter. I am a single mother and this ring is extremely sentimental to me. I loved the choices and the ability to customize the exact piece I wanted. I was slightly nervous at first to order all 4 rings, as I have small hands and fingers, and didn't want it to look too big or overtake my hand! I was beyond thrilled when it arrived. It was much more dainty then in the pictures. I also couldn't believe how quickly my ring arrived. Within a few days of ordering I was able to wear and show off my beautiful ring!! I will most definitely be making more purchases! Thank you, thank you!